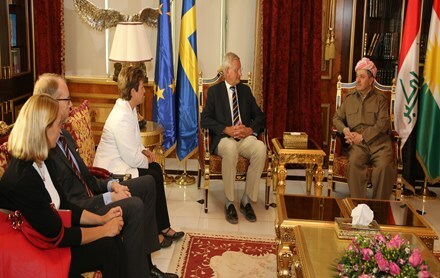 Kurdistan Region President Masoud Barzani today met with Sweden’s Foreign Minister Carl Bidt and EU Commissioner for International Cooperation, Humanitarian Aid and Crisis Response, Kristalina Georgieva. In a meeting in his office in Salahaddin, President Barzani called for more humanitarian aid from the international community, saying that hosting and providing for the basic needs of more than 1.5 million IDPs and Syrian refugees in Kurdistan is beyond the capacity of the KRG. The President thanked political and humanitarian support from EU countries but added that much more needs to be done. President Barzani also said that the visits by European officials and their public messages of support gives the people and government of Kurdistan hope and confidence to stand firm against ISIS terrorism and in providing aid and shelter for the IDPs. Swedish Foreign Minister Bildt expressed his country’s full support for the KRG in its fight against the ISIS and said that all EU countries are intent to help the KRG in dealing with the large number of IDPs and that they have also agreed on a long-term strategy to confront the ISIS threat. He said that ISIS is a threat to the whole world. EU Commissioner for International Cooperation, Humanitarian Aid and Crisis Response, Kristalina Georgieva also praised the KRG for its generosity towards the IDPs and refugees and said that the EU would continue to provide humanitarian in Kurdistan for as long as it is necessary. President Barzani agreed with Foreign Minister Bildt that forming a truly inclusive, representative government in Baghdad would constitute a major step forward to defeating the ISIS threat, but added that this is the last chance. He attributed the current dire state of affairs to the wrong policies of outgoing Prime Minister Noori Maliki.